With close to 4.5 million admissions recorded since its Sept. 22 release, the hard-hitting drama <Silenced> continues to make its presence felt at the local box office. In the two weeks from October 4-18, the film sold close to 1.4 million tickets, as local press continued running stories about sexual harassment and the real-life trial on which the film was based. Nonetheless by mid-October, it was becoming apparent that the film would not likely have the staying power needed to catch up with the year's highest grossing Korean films War of Arrows and Sunny, each of which have sold over 7 million tickets. 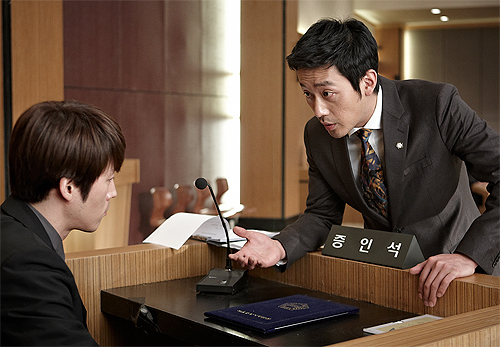 Meanwhile, a courtroom thriller of a different type turned in a strong showing in its second and third weeks. <The Client>, a fictional story about a dramatic murder trial, sold an additional 1.2 million tickets to bring its total to 2.1 million admissions. The film starring HA Jung-woo (<The Yellow Sea>) has benefited from positive word of mouth, strongly outdistancing local thriller <Countdown> which was released on the same day. Less fortunate has been the baseball drama <Fighter>, about an older player struggling to return to the major leagues. Director KIM Sang-jin has turned out his share of commercial hits in the past, including <Attack the Gas Station> (1999) and <Kick the Moon> (2001), but Fighter failed to reverse his box office slide in recent years. The film has taken in just under 200,000 admissions in total. Hollywood cinema also turned in a strong contender with Real Steel, which topped the box office in its first week on release. Local audiences have responded warmly to the film, which provides a mix of futuristic robot boxing and father-son drama. Local commentators are now waiting to see if it can hold its ground against an upcoming Korean film which also has a boxing theme. In preview screenings alone, <Punch> ranked #8 in the two-week box office chart, boding well for its official release which takes place on October 20.